From the Hot Tip to the Red Centre. Punsand Bay, QLD. 6th August 2015. I’m pleased to say I did eventually make it there. Punsand Bay had been a good place to rest up for a couple of days but now it was time to move on. Scott left too and he called round to say goodbye about 08.15. Clearly a well organised guy. I headed back to Bamaga and went to the hotel I’d stayed at previously. I wanted to use their wi-fi as I still had some time to run on the access I’d bought. Unusually, when I bought 24 hours access, I actually got 24 hours of connectivity. OK, time for a bit of a moan here. Australia and NZ hostels and hotels generally charge for wi-fi access. To me this is simply wrong. It’s as essential these days as the bed you sleep in and should come as part of the package. You will get either a time or an amount of download in Mb’s or Gb’s. One problem with paying for time is that the system often starts the clock when you first log on and then it keeps running even if you’ve logged off. In other words you’ve bought a period of opportunity to connect rather than a period of connectivity. That, to me, is a scam. If it was free anyway none of this would matter. Some hostels are getting better, to be fair, but it’s slow work. Anyway, I knew I had time left out of what I’d bought and the staff at the hotel were happy for me to sit outside with my laptop and use it up. When it ran out I went up the road a bit to the BP garage were they had 30 mins free wi-fi for anybody who asked for it. Free wi-fi in the middle of nowhere! Some businesses can get these things right. I bought a coffee and a roll and enjoyed an hour’s worth. The great thing was that I got plenty done and even got a blog post uploaded. A morning very well spent. Things deteriorated when I got back on the road south. It is, as suggested, rough as guts. The section just before, and just after, the Jardine River ferry was very badly corrugated and by the time I got to my destination at Bramwell Station, I’d been shaken to pieces. On the way up I’d camped at Bramwell Roadhouse, the station was a better place, with better facilities at the campsite. About 11kms off the PDR, it had a nice bar where I booked an evening meal. They’re renowned for the quality and amount of food served and tonight’s special was a BBQ Smorgasbord – and very nice it was too. I’d decided it was time to treat myself. Kal and Ros’s trailer. Very well equipped and tough enough for roads like the PDR. There’s been a bit of a running theme with regard to my camping situation. I always seem to struggle to get up, organised, packed and away within my target time of two hours. I don’t know what it is, but I just can’t seem to do it. This particular morning I was on target to succeed until I got chatting to my neighbours. Kal and Ros come from near Fraser Island, on the north QLD coast. They were on their way back from the Tip and had stayed at Punsand Bay too. I was interested to see their camping trailer. I’d heard that these can cost over $60,000 but Kal said those were the ultra special ones, with solid floors and top quality bearings on all the sliding draws etc. The cheaper ones have a soft base and less expensive equipment. The difference in the bases affect how easy it is to set up the tent that is part of the rig. Kal enjoyed messing about with his and making improvements to it. A man after my own heart. I was fascinated to learn that trailers and caravans have electrically operated brakes. They work off the brake light circuit of the towing vehicle and can be controlled from the driver’s seat, for example, to be switched off when reversing. Most European trailers have overrun brakes, although this more modern technology may have caught on by now. I was happy to be delayed because we had a nice chat about our respective journeys. They’d heard about my escapade so I told them all about that too. I finally left far later than I intended but wasn’t bothered by it. Onwards, back down the PDR and when I came to the stretch where I’d lost my fuel bladder I rode down the wrong side of the road looking for it. No joy, but I owed it to myself to try. Eventually I was back at Musgrave Roadhouse and set up my tent once more. While I was there I met a group of guys on bikes and a couple of fourbys, who were heading up to the tip. I gave them as much info as I could about the track, the part of it I’d ridden at least. Then I asked them where they were from and they said Gladstone. ‘Do you know Mitch Brown,’ I asked? ‘We work with him!’ they replied, in chorus. Ah well, another ‘small world’ moment. Doug, Ben, Craig, Chris and Alfie – nice to have met you all. All the way up Cape York I’d been planning the next stage of the journey. I wanted to get to Alice Springs and the shortest route looked to be south eastwards along a ‘four wheel drive only’ track. It would save a huge distance compared to the more conventional route. I’d spoken to several people who’d used it, including Brad, and they all said it was a good road. The only problem was that it was a 500km journey with nothing on the route. No shops, fuel or anything else. It was the lack of fuel that worried me. I’d have to carry all I needed and I’d already lost my fuel bladder! 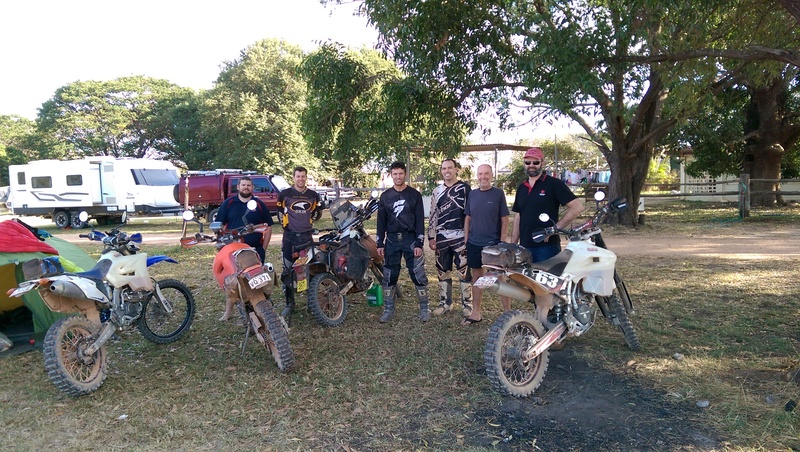 While I was at Musgrave Roadhouse all the problems resolved themselves. I chatted to the owner and he found me an empty 5 litre can. He also told me the Mitchell River, about halfway along, would have water flowing. One of Mitch’s friends loaned me a 3 litre fuel bladder which he wasn’t using. Petrol and water sorted out so any doubts I had about the route were gone and I could tackle it with confidence. It was a couple of days alone, out in the wilds and I was looking forward to it. 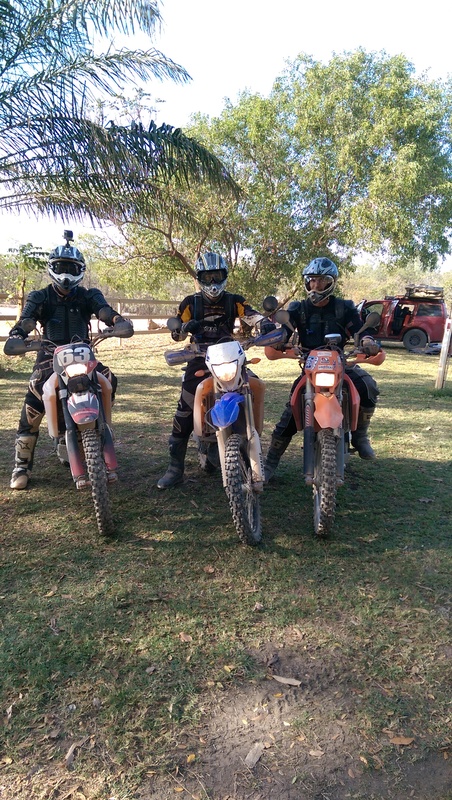 Have a nice ride guys. You’ll be having fun. All of the guys were ready to go so we took photos and I saw them off. But then a bizarre little incident occurred. There were a small group of people who I remembered seeing at Gunshot Creek, having fun getting their vehicles across. One of the women came to talk to me about my adventure and then she produced her copy of the Torres News and asked me to sign it for her. I was surprised, to say the least. This was only a few days after it had happened, remember. 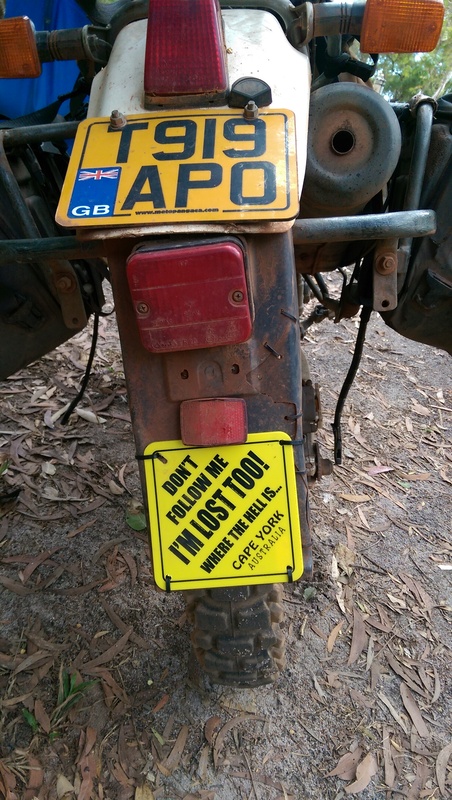 But it seemed I was now well known, among the Cape York travellers at least. The turn off I needed was only a few kms south of Musgrave and I was soon rattling along a very good quality dirt road. 4WD only? I met three road trains carrying cattle from the surrounding stations. None of them are 4WD! 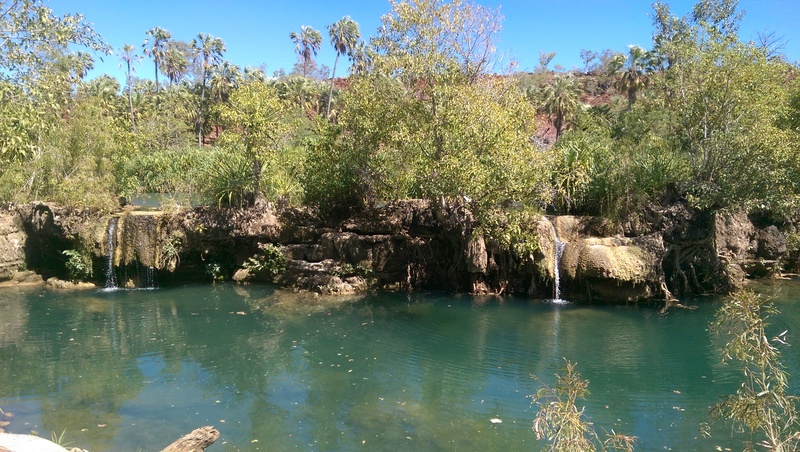 So it was a pretty easy ride to the Mitchell River, where, after a bit of scouting, I found a nice bush camp. I collected water from the river and had a relaxing night before setting off next morning to finish the ride into Normanton. I reached there without having to use my last can of fuel so I was pretty pleased with how things went. It just goes to show, provided I stick with what I know I can find the places I want to get to without any dramas – or rescues! There were plenty of creeks to cross according to the map. Like blue veins across the skin, they were everywhere. Except none of them contained water, fortunately. Normanton is a small town which tries to make as much as possible of it’s attributes. There aren’t many. But I found a good campsite and was pleased to see wi-fi included in the fee. About time too. Hostels of Australia, please take note. I pitched my tent next to a nice German couple, over here for a three month tour. Thomas and Suzi had bought a Toyota fourby from a dealer in Adelaide (I think) who guaranteed to buy it back from them at a decent price. It seemed a good way of getting transport sorted out for short visits. We enjoyed socialising during our time there and they told me of some good places to visit. Once my tent was up I noticed that my rear tyre wasn’t. Flat, and not interested in taking air, it seemed I had a puncture repair on my hands. A job for the next morning. Why is it that no matter how careful I am I seem to pinch inner tubes more often than not? Repairing this puncture involved the same pantomime as had happened too often already. It’s especially annoying when it’s a brand new tube that gets pinched. The puncture seemed to have been caused by the tube rubbing on the tyre security bolt, suggesting too low a pressure for the stony surface that the track became. A lesson for the future then. While my hands were dirty I adjusted the valve clearances and attempted to get my chain oiler working a bit better. Then a few things came together regarding fuel bladders. I cleaned out and posted off the one I’d borrowed. Then I emailed Liquid Containments, the company that makes them, and told them my sad story about having lost two, any chance of a discount on a new one? The answer came straight back – $65 with postage. That’s about half price! I was very pleased with that and arranged for one to be sent to me at the post office in Alice Springs. Despite the hassle of the puncture I’d had a productive day in the end. Next morning I got stuck in to replacing my lost camera. It was a Panasonic Lumix waterproof/dustproof/shockproof model and was going to replace it with the Olympus version. In the end I didn’t because charging the battery involved plugging in the camera rather then using a separate charger. A daft idea in my opinion, especially if staying in a hostel or similar. Also I discovered that my Lumix had been upgraded. Better the devil you know and anyway, I already had a spare battery for it, so I ordered one of those instead, also to be sent to the PO in Alice. Krys was a big bugger! I took a walk around Normanton, keen to see the sights. It didn’t take too long. These small towns tend to be one long street with a few shorter ones running off them. Think small American town. Normanton has an old hitching rail, just to add to the impression. I know because it’s on the list. Perhaps the oddest sight was a life size model of a huge crocodile. Krys – The Savannah King measured 8.63 metres in real life and the model reflects that. When looking at it the impressive thing to me wasn’t the length but the girth. It weighed over two tonnes and it looks it. It’s the largest recorded example of a saltie. 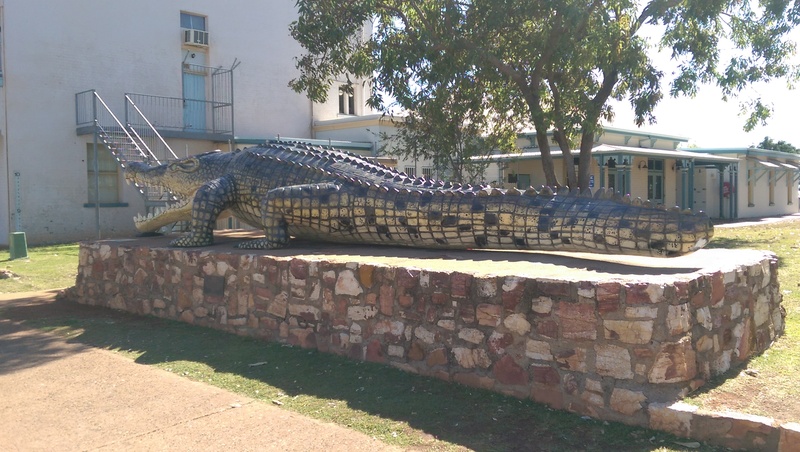 Krys is named after Krystina Pawlowski, one of the many croc shooters operating in the area in 1957. She killed it in the Normanton River. This long pre-dates crocs’ protected status. Another feature I enjoyed very much was the old railway station, with its museum and collection of rolling stock. 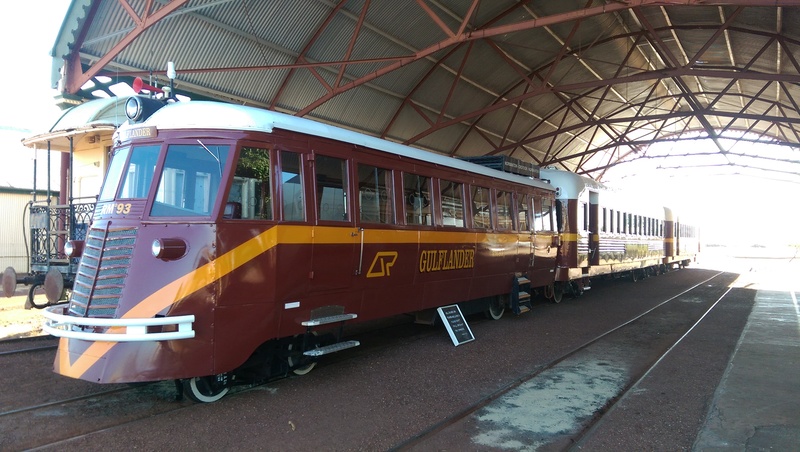 It’s only a short line and in common with many others around the region was built in the gold and mining boom years. They tended to be short and therefore so did the railways. This one goes to the town of Croydon, about 90kms away. The present tense is applicable because they operate heritage journeys out there and back, over two days. 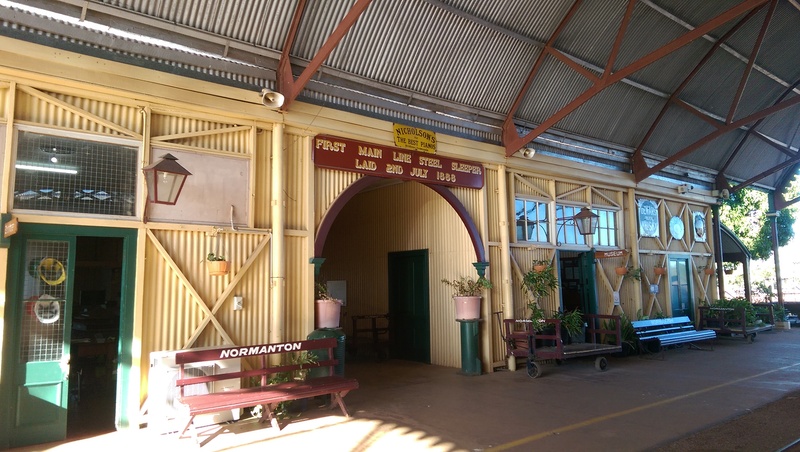 Normanton Station, now a museum. There are two interesting features to this rail system. The first is the engine, which uses a diesel engine to drive the wheels directly. It has a four speed crash gearbox so is like driving a vintage truck. This seems like a strange method but was common enough on small networks. The second is the construction of the line. The engineer was very forward thinking and he persuaded the owners to let him use a different method of construction. The common way was to build an embankment and lay the line on top, using wooden sleepers. He convinced them that a better way was to lay the track on flat land using steel sleepers, hollow and filled with dirt to weigh them down. Hi argument was that although more expensive initially, in the long run it would be cheaper. During the Wet embankments tend to get washed away and have to be constantly repaired. 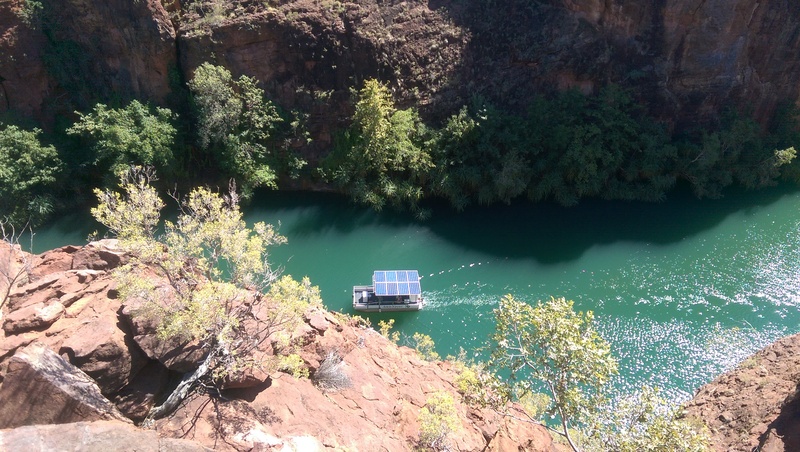 No embankment, no problems and no ongoing costs. Simple but effective. 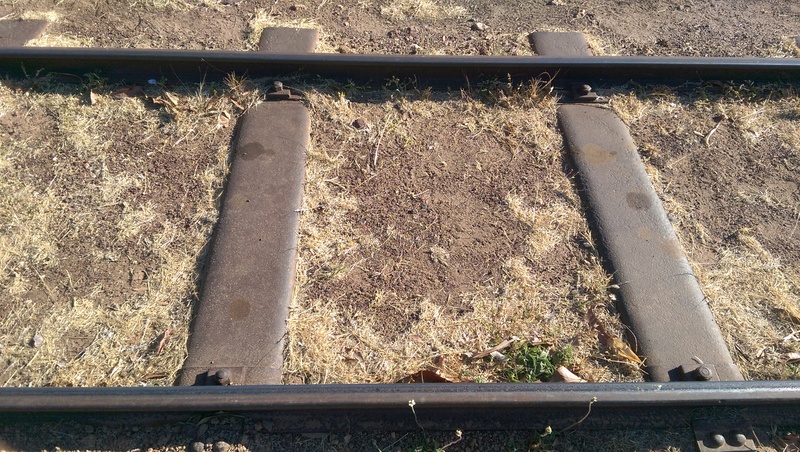 Earth filled steel sleepers Almost all still there 130 years after being laid. It seems like the man was right! Lastly, there is a Town Bore. No, not the bloke in the pub who won’t leave you alone, but a water bore hole. 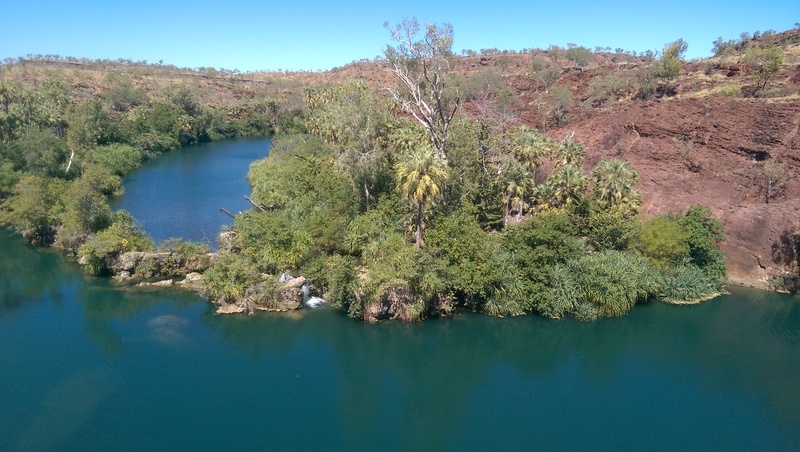 The town sits on part of the Great Artesian Basin and the 2330ft deep borehole was dug to gain access to the naturally heated water below ground. It used to feed the town baths but now only supplies water to the camp site I was at. It has a lot of fluoride in it and comes out at a temperature of 65C. You have to leave the hot tap running for quite a while though, it’s got a long way to travel! One final job before leaving Normanton was sort out my earphone earplugs. Ultimate Ear, a company based in Orpington, make custom fit silicon earplugs for motorcyclists and others. They’re great things to have as they reduce wind noise right down, thereby reducing the risk of hearing damage. They can make them with built in earphones too. Just right for sat nav, intercom or music on the move. A couple of days before getting to Normanton the left earphone had failed. I was really annoyed as the long distance riding was made much more pleasant when accompanied by music. So they got posted back to the UK for repair. As I write they’re on the way back to me, fixed and good to go. The Burke Highway is named after the leader of this ill-fated expedition. My general direction of travel now was south west, towards Alice Springs, along the Burke Highway. As well as being a destination in itself, it’s also the launchpad for several ‘must see’ natural wonders within Australia’s Red Centre, chief among these being Uluru or Ayers Rock. En route from Normanton lies Lawnhills Nationa Park, a place with a famous gorge. The dirt road took me to Gregory Down where I stopped at the roadhouse to refuel. They’d run out. What? Yes, run out. Expected delivery time ‘later on’. The tanker had just left one of the cattle stations and was on the way. The problem is that he didn’t know which station. I had hoped to get to the camp site at Adels Grove, near to the NP, but that wasn’t going to happen. Fortunately there was an unofficial roadside camping area. ‘Unofficial’ enough to have a tap nearby and public toilets five minutes walk away. The conurbation of Gregory Downs consists of the roadhouse, a council road depot and the aforementioned toilets – which also have cold showers. I was getting a real outback experience here. If there’s no fuel, you wait. If you need to stay, find a place by the side of the road. If it’s likely that will happen councils will often provide facilities. It was frustrating to have to stop only 90kms from my destination but the upside was the roadhouse and the very nice Chicken Schnitzel they served. Sound advice. I took it. A short ride next morning got me to Adels Grove camp site. A really lovely place next to a beautiful creek. They had canoes and kayaks for rent and also provided inner tubes for swimmers in return for a ‘gold coin’ donation, i.e. a $1 or $2 coin in the box. This is a fairly common way of covering costs for these small items. Once my tent was set up I spent a happy couple of hours trying to get the zips working properly. Last night’s spot was very dusty and I think an accumulation of dirt was jamming them up. Tent maintenance. The joys of life on the road. There were a couple of very nice walks from the camp site. One was up a low but steep hill to a nice lookout, with a view of the surrounding sandstone ridges. The other was alongside the very pretty creek. Tree lined, deep pools, little cascades of water. A very pleasant and cool place to walk after a hot climb up Lookout Hill. When visiting places in the dry it’s not always easy to appreciate how much water comes along these creeks during the wet season. The creek is not especially wide but it’s course is. It’s also filled with dead trees and other detritus which is clearly washed down by the rushing waters.. Nature’s way of having a clear out I suppose. If you’re walking through a gorge then the evidence is on the rocks each side. They’re worn smooth up to the flood level, rough and jagged above that. I’ve seen that effect as high up as eight metres. The power in the water flow must be incredible. Out in Lawnhills NP next day I had several walks to choose from. The first, and most impressive, was up a hill called The Island Stack. A steep, rocky climb took me to various lookout points from where I could see the Gregory River running through a steep gorge. 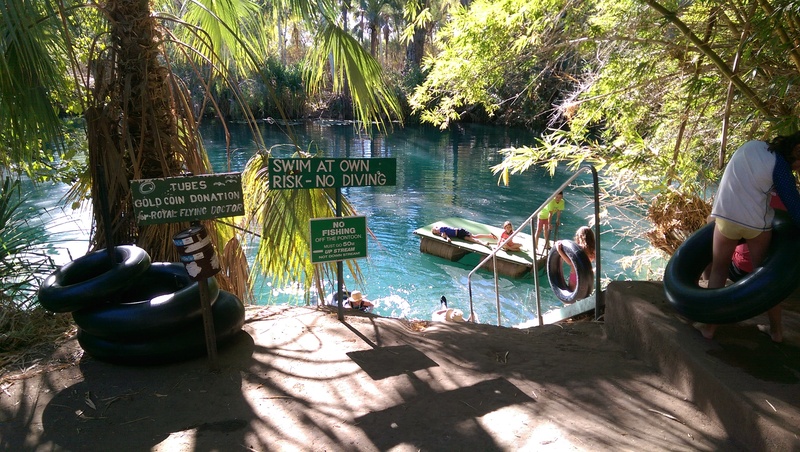 The water is 26 metres deep in places and is a lovely green colour. The kayaks, which Adels Grove camp site hires out, were much in evidence here. It must have been nice and cool down there at water level, on the serene green river. The view across the gorge to the surrounding hills was excellent and the info boards explained how the area used to be an inland sea until some surface upheavals changed the landscape and created the hills. The sandstone is a lovely red colour, looking great in the sun. Mixed in with it is limestone and in places there are stratified layers of the two rock types. Indirri Falls, from the Island Stack. And from a little close to. The path back down took me too Indarri Falls. Nothing spectacular in terms of height but they are very pretty nonetheless. They have a nice shape and plenty of vegetation around the edges, with the river in front and behind it. Swimmers were enjoying the cool water. Not me though! This river never dries up because it is fed by underground springs. But its other supply of water comes from the rocks. They absorb huge amounts of rain during the Wet then slowly release it over the dry season. 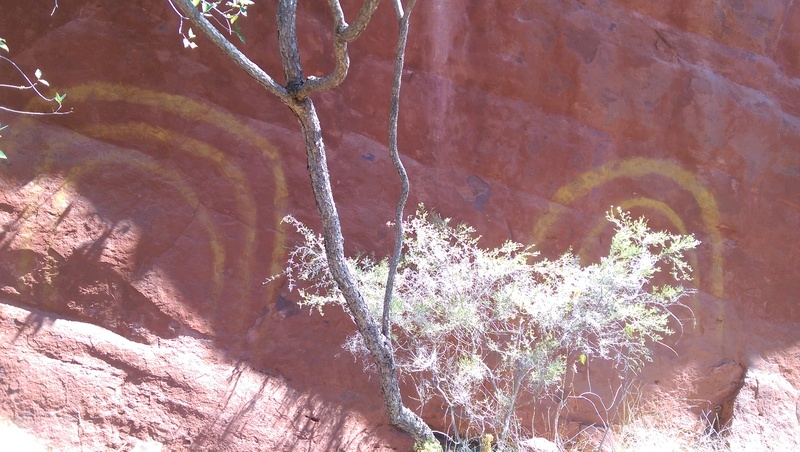 I walked back to the car park then continued along another path, past some Aboriginal rock art and carvings. Reckoned to be about three thousand years old, the paintings were quite simple as were the carvings in the rock. Further on the path followed the river for a while and I saw a freshie swimming along although I needed the eyes of a young girl, out with her family, to help me spot it. Not especially attention grabbing, in my opinion. That was a day well spent as the NP has a variety of attractions but all quite close to each other. 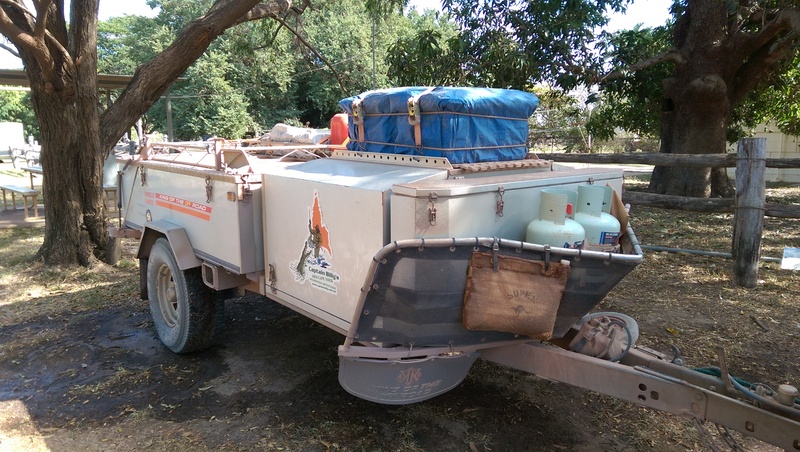 The info boards were very good and making kayaks available for hire is a great idea on the part of the camp site.They also run river trips on a solar powered boat. Eco tourism seems to be a big thing in these parts. It’s good in its own right but it also helps to protect the Aboriginal sacred sites and preserves precious water too. There was nothing ahead of me now apart from a gravel track for about 100kms followed by some big distances on the bitumen. 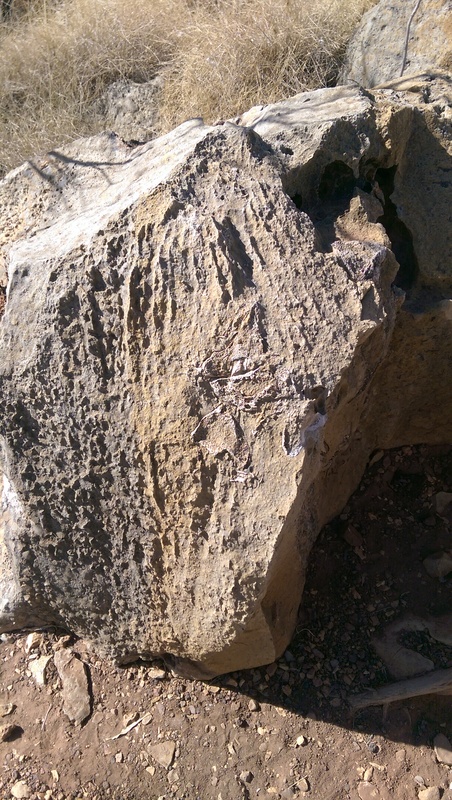 I stopped for a look at some fossils as I passed through Riversleigh Station. 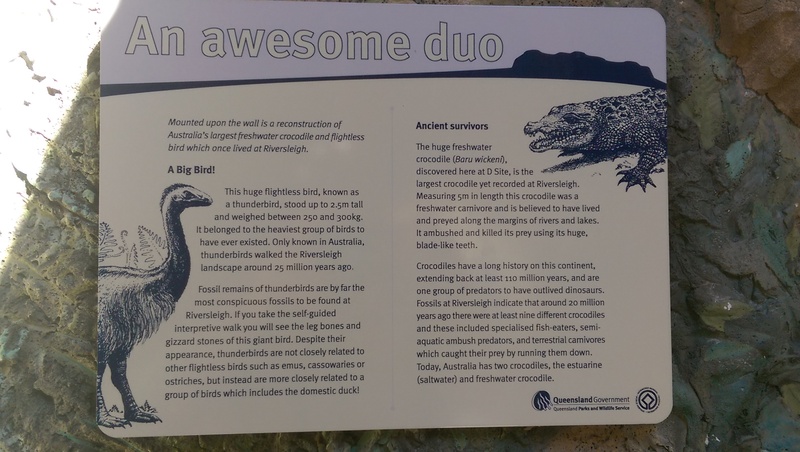 It’s a world renowned fossil site but I felt vaguely disappointed by the small size of them. I expected a Dinosaur leg at least. But it shows that big stories can be told from small pieces of evidence. If its been given World Heritage Site status, who can complain? A couple of Aussie residents from ancient times. Small bones tell big stories. Outback Oz caught me out again when I got to the town of Camooweal. It was Saturday and the main shop had shut at lunchtime. The much smaller shop next door didn’t have very much. I needed porridge oats and ended up with a tin of stew. Good enough for breakfast next morning though. At the Servo where I filled up I had a coffee, a sandwich and bought two bananas. $17! Another example of outback Oz catching me out. The two girls working there were Brummies, for their sins. All that was left to do now was motor on. 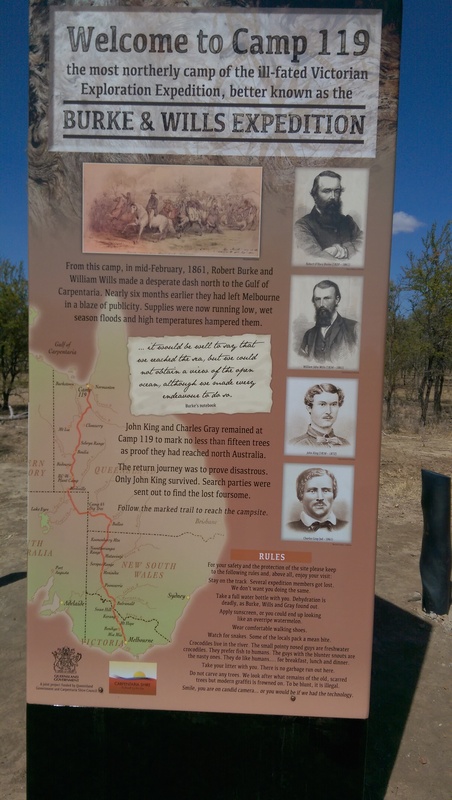 I was on the Barkly Highway, part of the Overlanders’ Way. This is one of the major east to west roads and is beloved by the Gromads. 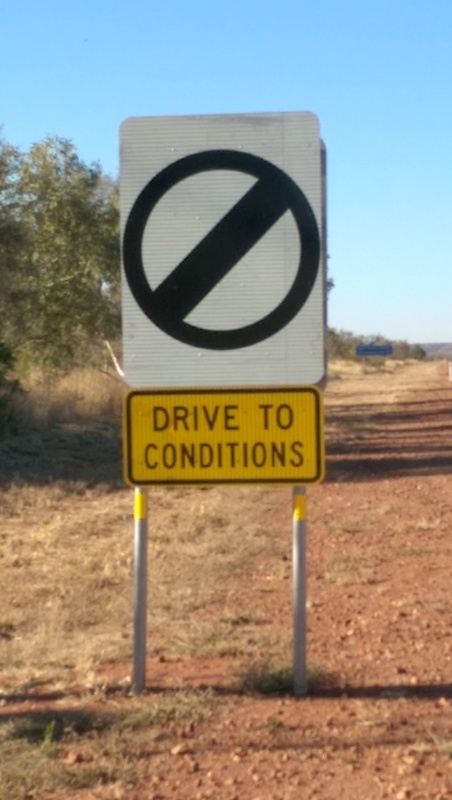 It eventually joins the Stuart Highway, which runs from Darwin to Adelaide. It was typical of the roads I’d been told to expect in Oz. Long, straight and potentially boring. Except that some people had relieved theirs by dressing up the termite mounds in T shirts, footie shirts or even, in one case, some army uniform. I was surprised to receive plenty of waves from other tourers as they drove the other way. Unexpected from fourby drivers, at first, but nice to see. There’s plenty of roadhouses along the way and the first one I stayed at was Barkly Homestead. This place looked fabulous, with green grass – how long was it since I’d seen that -and flowering shrubs. So why the hell can’t they manage to put a mirror in the washroom? Guys, it’s the little things that count don’tcha know. There were four other bikers staying there. We enjoyed some chats during the evening. 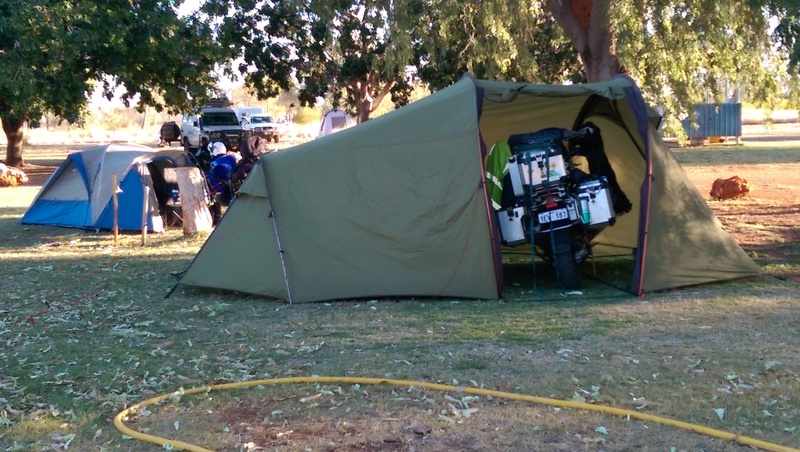 One of them was on a BMW R1200 Tourer and his tent included a garage for the bike. You can make up your own comments here ………………………. Any room for Doris in their, Big Boy? On down the Barkly Highway, turn left onto the Stuart Highway and just keep going. The free maps I got from the RAC Queensland do a great job of showing where fuel and camping exists. On these long roads they are mostly roadhouses with all the requirements for an overnight stop. I was heading for Barrows Creek but on the way I stopped to look at a couple of sights. 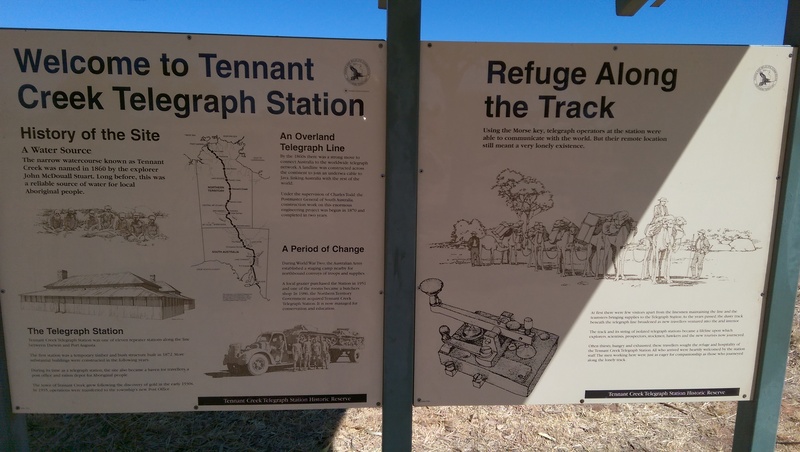 Near the small town of Tennants Creek is the Old Telegraph Station. This is a notable piece of Aussie history because it’s one of several repeater stations on the telegraph line which finally linked Australia with the rest of the world. There was an undersea line being laid to Indonesia, which would connect to the network that eventually ran to London. The government wanted to link the populous south of Australia into this network soduring the 1870’s a south to north line was built. It was planned to take two years but was completed early. From that moment communication with London took hours instead of weeks. It began to change prospects of this far flung colony in many ways. I was chatting with another visitor there and, realising I was English, she commented that an old telegraph station hardly bore any comparison to the history we have in Britain. I said that it was more interesting in many ways because it’s all about the building of a nation. European history is mostly about princely egos and religious arguing. Not exactly enervating. A bit of info on the telegraph line. 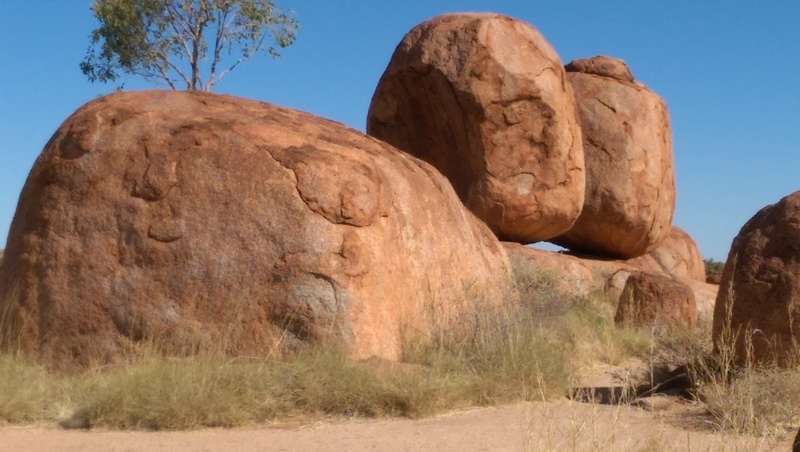 Further down the road I branched off for a look at the fabulous Devil’s Marbles. It seems he lost them here. Probably the heat and the flies. Ancient granite forced up by volcanic action, and the effects of erosion on it, have left these huge boulders perched on top of each other. They look like they’ve been piled up but in fact they’ve been worn down. They do look amazing though. Nature can do some strange things. The roadhouse at Barrows Creek is a bit of a dump and that was reflected in the camping price of only $5 for a patch of dust. In fairness the current owners have only just bought the place and are improving it, building a motel and new facilities. They do a cheap dinner so I took advantage of that and was fascinated to find, in the bar, a whole load of information on the Peter Falconio incident. It all took place nearby and is well worth reading up on. There’s no speed limit on some sections of the Stuart Highway. 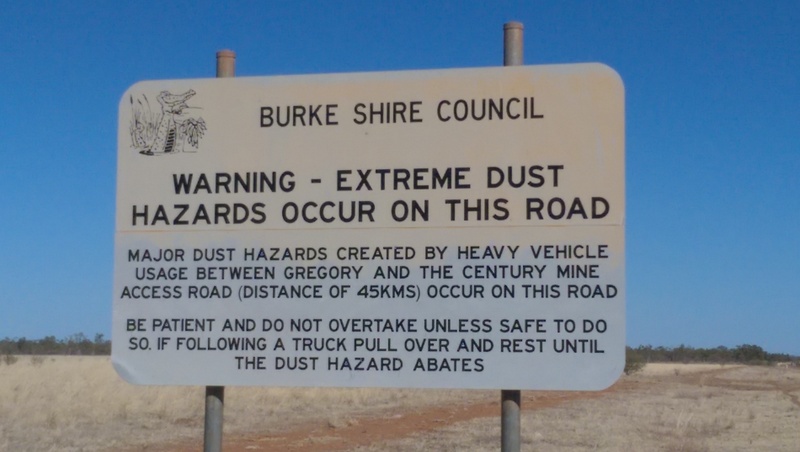 A very rare sign in Australia. Eventually I made it to Alice Springs, the nearest big town to the centre of Australia and gateway to the Red Centre. The ride had been chilly although I noted we got as high as 740 metres at one point, so no great surprise. I had to fill up at the first servo I saw as I was running on fumes. The consumption had been very high along the open roads. There’s always a wind blowing and it had obviously been blowing at me, at least some of the time. This was worrying as I had plenty more long runs to undertake. But on the upside I was in a town with two big supermarkets, plenty of shops and a very nice hostel for me to stay at. 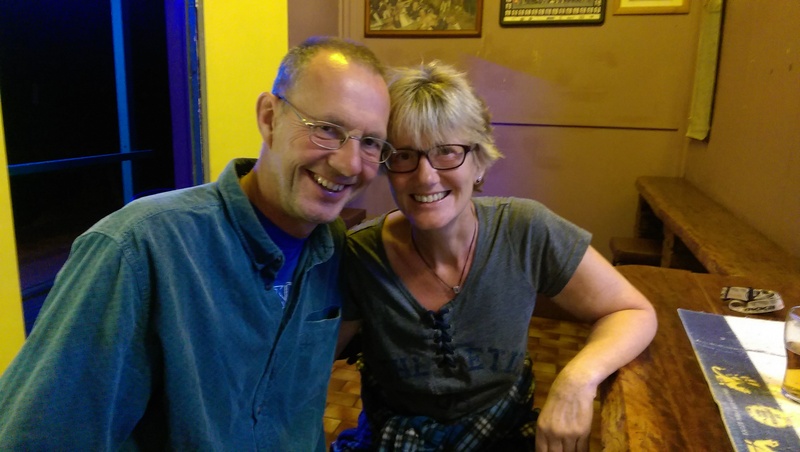 Heidi, from Oregon, and Patrick, from Holland, looked after Alice Lodge Backpackers and I had a comfortable bed, with wi-fi and breakfast included in the price, and a free BBQ on Thursday evenings. I had a few tasks to complete while I was in town but first it was time to clean up and chill out.